MOVEMENT HELPS YOU TO CONNECT WITH YOUR BODY AND LISTEN TO ITS NEEDS AND TO THE NEEDS OF YOUR BABY. I couldn’t agree more with these words than now, after experiencing on myself what movement did to my body and to my mind during the first trimester of pregnancy. Months in which the only thing I wanted to do was lay in bed, sleep and sleep again. When my body was not allowing me to keep much food or liquid, neither I had any appetite to put them in. Months in which my brain was locked in a cupboard and I couldn’t find the keys to open it. But during these months of feeling unable to look after myself and my two boys who were needing so much attention, I discovered a resource of help, of energy, of positivity: MOVEMENT and MUSIC. Bizarrely, moving and teaching classes was my moment of relief, of slowly trying to take ownership of my body. Dancing allowed me to feel the changes happening inside me, so vividly, so clearly: my body was working sooo hard to create the new little human that is now growing inside me and I could feel everytime my body needed me to stop, or was implicitly asking me to give it the positivity energy to move. When I was dancing and teaching, all the negative thoughts that constantly were passing into my mind (frustration for not feeling well, for being unable to look after the kids, for being unable to teach as I wanted to), were disappearing. I was immersed in the music and in the tentative of giving back to you mums the same energy I was receiving: your love, your kindness, your positivity have been a source of inspiration for me. Movement has taken me closer to my body and allowed me to trust its innate wisdom. When I was feeling down with energy and with mood, I listened to music and forced myself to move. Even at home. And I believe it is due to that (plus sessions of meditation and hypnotherapy from a dear friend that helped me specifically for the morning sickness) that allowed me to start feeling better at only 11 weeks, much earlier than the previous two pregnancies. So if I learned something that I want to share with you is: keep on moving, even if it’s a walk in the park, and listen to your favourite music. Your mindset will change. And your body will react differently. Meditation will prove that too. So, if you haven’t reserved your space for your next class, please do so… our community is growing and I want to make sure there’s a space for you all in our classes! And, if you have friends who love to dance, but never thought they could start or re-start now, share the love and INVITE THEM TO JOIN our Ballerina Mums Community. I’ll look forward to dancing together, in our Pregnancy, Mum&Baby and Adult (or “night out”, as we call it!) 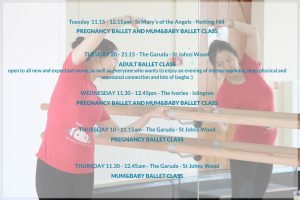 ballet classes, and to discover how BALLET CAN HELP YOU FORM A BOND WITH YOUR CHILD THAT WILL LAST A LIFETIME.